10 Brisson Street - Newly Modernized Beach Cottage w/ Ocean Views from the Fabulous Roof Deck! Call Seashore Property Management to reserve your 2019 preferred summer week! 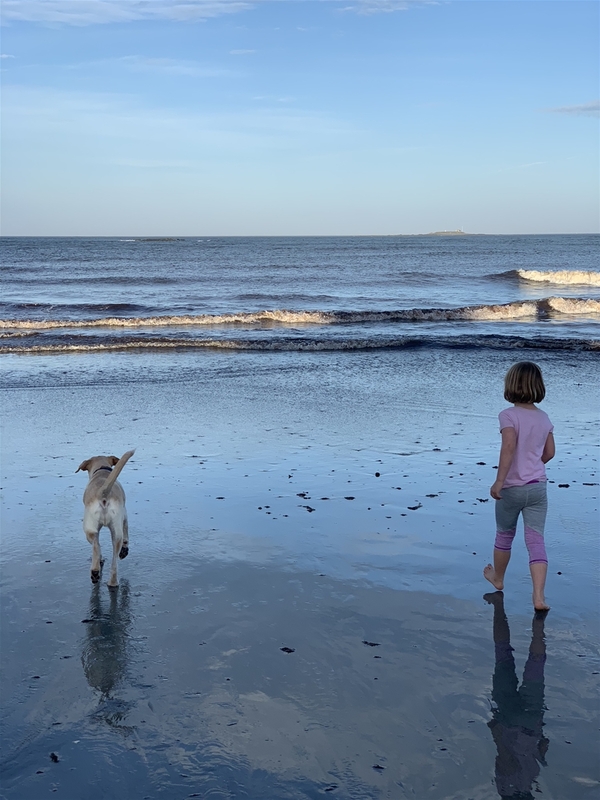 The perfect Maine vacation can be found on the 7 mile stretch of the most pristine beach stretching from Saco Bay to Old Orchard Beach to Pine Point in Scarborough. And you can enjoy it all in the comfort of your home away from home. We offer vacation rentals to fit any budget. You and your friends and family can have that vacation you have been dreaming of. One that has a beautiful sandy beach, clear Maine ocean waters, and so many things to do from exploring the Pier at Old Orchard Beach, the center of recreational activities featuring amusement rides, games of chance and food that will appeal to kids and adults alike. You can indulge in the French fries, fried dough, pizza, burgers while exploring the beachfront gift and souvenir shops. And then the family style restaurants and elegant dining to round out your vacation. Family festivals and fairs, free concerts and fireworks most Thursday nights. If you are looking for excitement after the sun goes down, there are nightclubs and arcades in abundance. If you are looking for a quieter vacation, we have beachfront homes away from the hustle and bustle in Ocean Park and Pine Point as well. Selection: With over 100 properties to choose from in Old Orchard Beach, Saco Bay and Pine Point, Scarborough, you will have no problem finding the perfect place for your vacation with family and friends. Choose from a variety of privately owned vacation rental homes, cottages and condos. From luxury to budget-friendly, ordinary to extraordinary, cozy to expansive, Seashore Property Management has it all. Value: Our vacation rentals provide a better value than hotels, motels or other lodging options, especially for families and groups. You will have more space, oftentimes, outside family areas as well as fully equipped kitchens, which mean big savings at meal times. Through our website, www.seashorepropertymanagement.com, we offer direct access to state of the art reservation technology, allowing our guest to browse at their leisure a variety of vacation rentals showing real time availability, and securely book a vacation rental online any day, any time! Convenience: We operate a full service rental office. Our office is conveniently located off of Cascade Road in Old Orchard Beach. We are now in Saco located at 937 Portland Road Suite E Saco, Maine 04072. From the Maine Turnpike take Exit 36 for Old Orchard Beach and Saco and then take Exit 2B. Our brand new office building is approximately 2 1/2 off of Exit 2B on your right hand side. You will see our signs and you will turn right, right after Cascade Road. Checking-In to your vacation home is easy! Activities and Fun Things To Do on Your Vacation! Our office is conveniently located off of Cascade Road in Old Orchard Beach. We are now in Saco located at 937 Portland Road Suite E Saco, Maine 04072. From the Maine Turnpike take Exit 36 for Old Orchard Beach and Saco and then take Exit 2B. Our brand new office building is approximately 2 1/2 off of Exit 2B on your right hand side. You will see our signs and you will turn right, right after Cascade Road. We have to adhere to a fairly strict check-in policy so that your vacation home is clean and fresh for your arrival. Check-in for houses and cottages ia at 2 p.m. and check-in for condos is at 3 p.m. We greatly appreciate your patience. We know you want to begin your vacation and we want you to enjoy every minute of it! If you find that you are going to be checking-in after 5 p.m., please notify our office immediately so that we can make other arrangements for providing your keys! Catering to tourists and families is a way of life in Old Orchard Beach. The beach, the arcades and amusement rides are all centered around Old Orchard's Pier which extends nearly 500 feet over the Atlantic Ocean. The Pier features shops, fast food and games of skill. You'll also find that Old Orchard Beach is ideally situated if your interests go beyond the lazy beach days and that perfect tan. The Route 1 corridor just west of town is a beehive of activity with two water parks, an amusement park, restaurants and shops. It also leads to the Maine Mall where over 140 stores await you. On the northeast end of Saco Bay is a quiet vacation spot called Pine Point. Located in the town of Scarborough, it forms one of the the seven mile beach that includes Old Orchard Beach. Pine Point offers a unique selection of gift shops, restaurants, lobster pounds, convenience stores, and charter fishing. South along Route 9 lies the quiet seaside area of Ocean Park, a historic cottage community noted for its religious, educational and cultural programs. The Ocean Park Association sponsors numerous lectures, concerts and other events. A few miles north is Portland, Maine's largest city, with a full array of stores, shops and dozens of galleries and restaurants. The Old Port is a showcase for artists, musicians, and craftsmen, and its waterfront has grown into a popular business and shopping area. Old Orchard Beach is easy to reach by the major highways in Maine. Exit 36 off of the Maine Turnpike (I-95) is the most direct route, or you can also access via Route One. By air, we are serviced by the Portland Jetport, 13 miles north or through Boston, from all parts of the world. You can now also use the Downeaster Amtrak Railroad service to come to Old Orchard Beach!